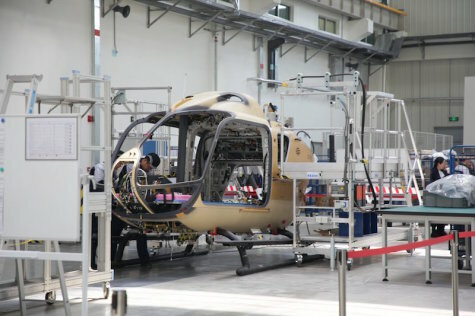 QINGDAO, China --- The Airbus Qingdao H135 Final Assembly Line (FAL), the first helicopter line built by a foreign manufacturer in China, was put into service Wednesday in Qingdao, a coastal city in east China's Shandong Province. It is the first time of Airbus has put final assembly facilities of the H135 helicopter outside Europe. The move marked a new chapter in Sino-European cooperation and Airbus' expanded partnership with China, according to Airbus. The first helicopter roll-out from the FAL is expected to take place in the second half of 2019. "China is the most promising helicopter market in the world. That is the best way Airbus to address our continued commitment and determination to deepen the cooperation with Chinese partners," said Marie-Agnes Veve, general manager of Airbus Helicopters China. 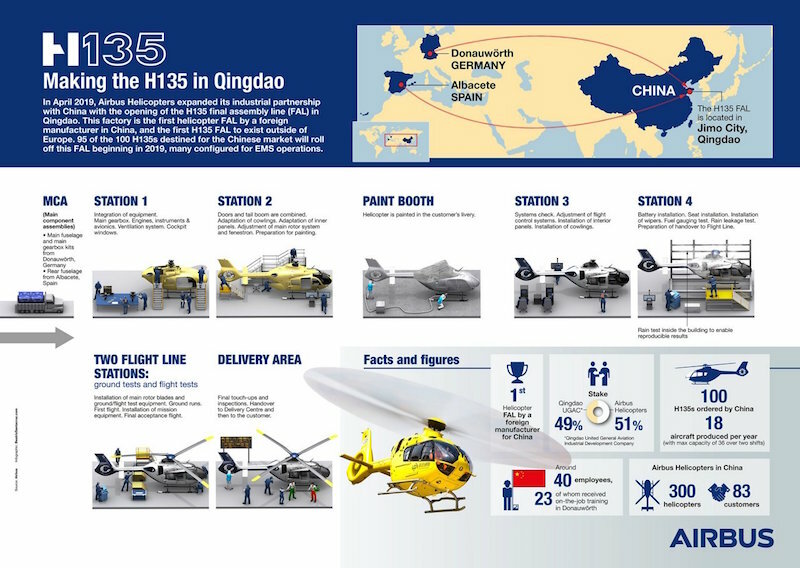 The Airbus Qingdao H135 FAL is a joint venture between Airbus Helicopters and United General Aviation Company. It follows a cooperation agreement between Airbus Helicopters and China in 2016 for the purchase of 100 H135s. The initial annual production capacity is 18 helicopters. And its capacity could be doubled to meet the growing Chinese demand. The H135 light twin-engine helicopter is a popular model from Airbus Helicopters. It can be used for helicopter emergency medical service (HEMS) missions, search and rescue, law enforcement, firefighting and tourism. QINGDAO, China --- Airbus Helicopters has expanded its industrial footprint and partnership with China with the opening of the H135 final assembly line in Qingdao. The factory is the first helicopter FAL built by a foreign manufacturer in China, as well as the first H135 FAL outside of Europe.